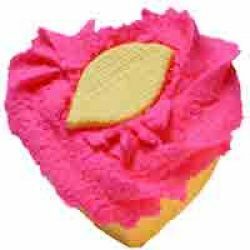 Get bath bomb recipes that were used in production in my bath bakery. You will learn to make bath bombs, bubble bars, bath cupcakes, floating LUSH bath bombs, fizzy frosting…get all those recipes and more. All of my top secret pro tips are here,too. For 7 years, I had a thriving bath bomb bakery. I’ve shared everything on this site: recipes, techniques, tricks, and supplier information. I mean, who does not like a nice bath treat? Learn to make a high-end creation where you control the ingredients. I’ve tried every craft, but bath bomb making is my favorite. Are you ready to get started? Click on the picture below to get to the recipe. Do you want to make bath bombs that float like LUSH? Two ingredients make a bath bomb float. Find out what they are and make yours float, bubble, spin…whatever you can dream up. Get our floating bath bomb master recipe here. Butter Bath Bomb Recipe – Best Seller for 7 years! Our top seller for 7 years straight was our moisturizing butter bath bomb. It is the perfect answer to dry skin. When you make bath bombs yourself, you get to be in control of the luscious butters and oils. Get our moisturizing Butter Bath Bomb master recipe here. Our bubble bar is special because they are activated by contact with water. In fact, as soon as water touches it, it starts to foam and cream. Put it under running water and you get mountains of long-lasting, creamy bubbles. Get the Bubble Bar Master Recipe here. In this picture, the frosting is pink and the fondant is yellow. Make this adorable, one-of-a-kind cupcake with Fizzy Frosting. It’s bubbly, awesome frosting that also makes a fondant that you roll out into adorable toppers. It is the coolest, most versatile, bath treat topping of all time! This special formula was my personal obsession. With the fizzy frosting recipe you can make both the pink frosting on this cupcake and the yellow lemon topper. The entire cupcake fizzes and bubbles when it hits water! Make the cupcake bottom with the floating bath bomb recipe. Want to ask any bath bomb recipe questions? THANK YOU! THANK YOU!!!! This is the most comprehensive site I have ever seen on bath bomb making. Truly outstanding. I am having a BLAST with my daughter!!! If you have any more tips, please post them ASAP. Love from Alaska. I love a hot butter bath bomb and wine! Oooooohhhh la la la! Can't wait to see your handywork!